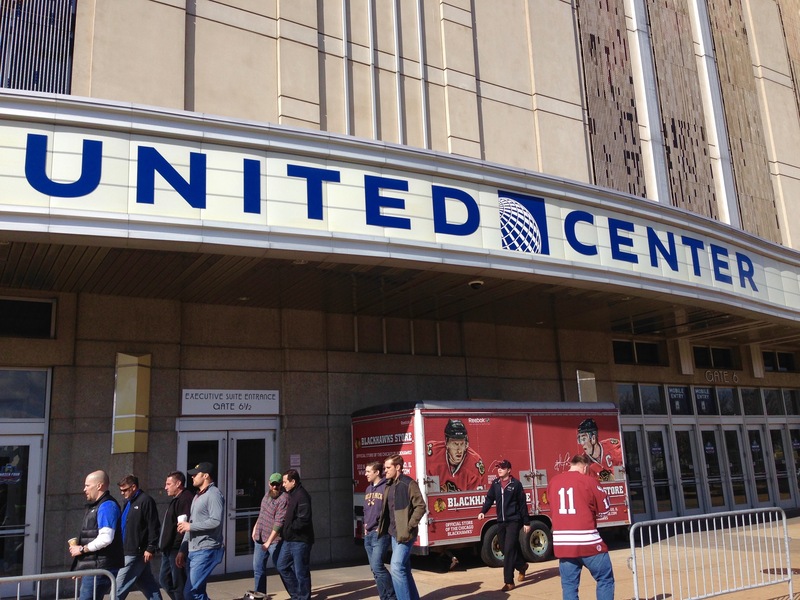 The Frozen Trifecta was back at the United Center on Saturday for some college hockey. 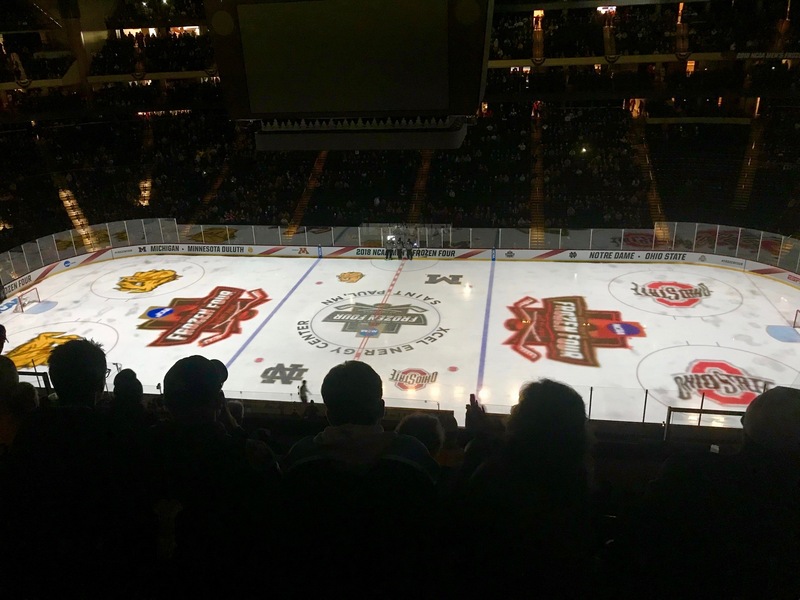 The University of Minnesota Duluth Bulldogs were facing the Denver University Pioneers for the Division 1 Championship. For the first time since the playoff selection went to the 16 team format, we had the #1 ranked team taking on the 2nd ranked team. Denver was the top seed, and they looked like it against Notre Dame in the semi-finals. Duluth would have their hands full. 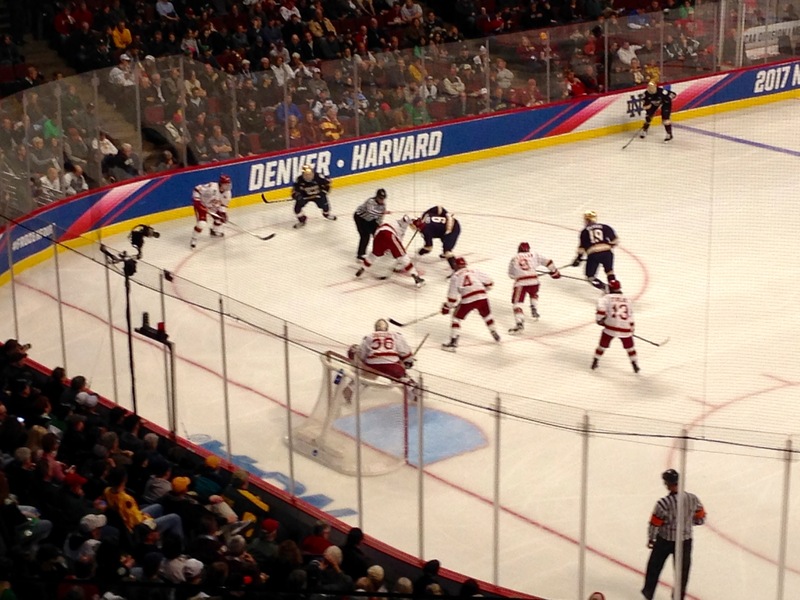 Denver continued where it left off against the Irish, and really dominated play to start the first period. Duluth settled down around the 10 minute mark, and the game was scoreless after one. Then things became interesting. Jarid Lukosevicius scored for the Pioneers at the 4:44 mark of period two. The announcer was still calling out who had assists on the goal, when Lukosevicius scored again, just 16 seconds later. 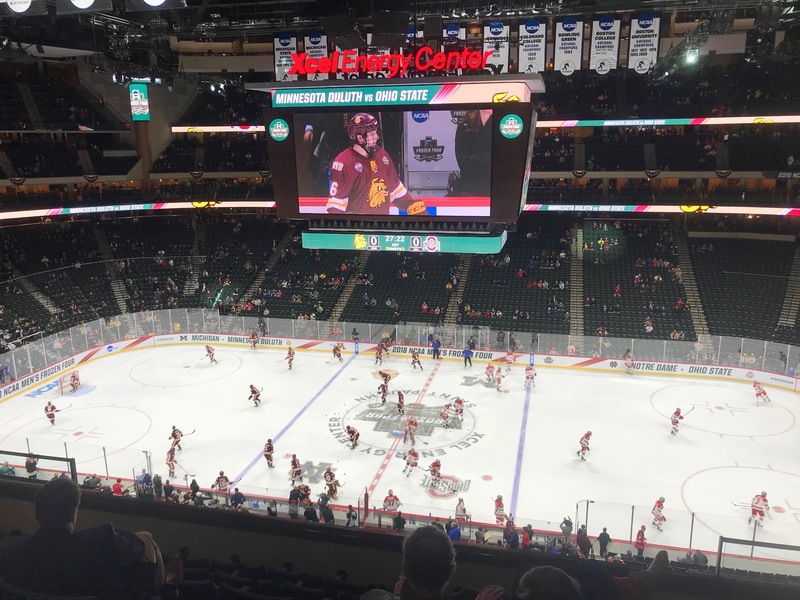 Denver could smell blood, and Duluth was in chaos, when the official called a television timeout, and the Bulldogs were able to regroup. Alex Iafallo, the hero from Thursday night, scored a power play goal for UMD, to make the score 2-1. Lukosevicius, out to prove that the third time really is a charmer, scored his third tally of the night. Lukosevicius’ hat trick happened over a span of 7 minutes, 39 seconds. The last time there was a hat trick in the championship game was in 1993, when the Denver head coach, Jim Montgomery, scored one for Maine against Lake Superior State. The third period began with Duluth down 3-1, and they came out on fire. Much of the play was in the Denver zone, and the Bulldogs were flying to the puck. Riley Tufte finally put one behind Pionner goalie Tanner Jaillet. UMD suddenly had new life, and they stepped up the pressure even more. Duluth outshot Denver in the third period 17-3. But Jaillet, who had just won the Mike Richter Award as the Nation’s top college goal tender, held firm. 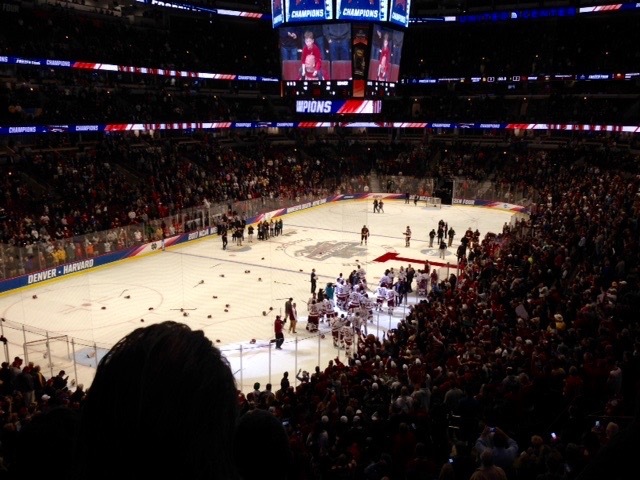 Denver would keep that one goal lead, after a wild third period, to earn their 8th National Championship in hockey. Jaillet would make 38 saves for Denver, and Hunter Miska would have 25 for Duluth. 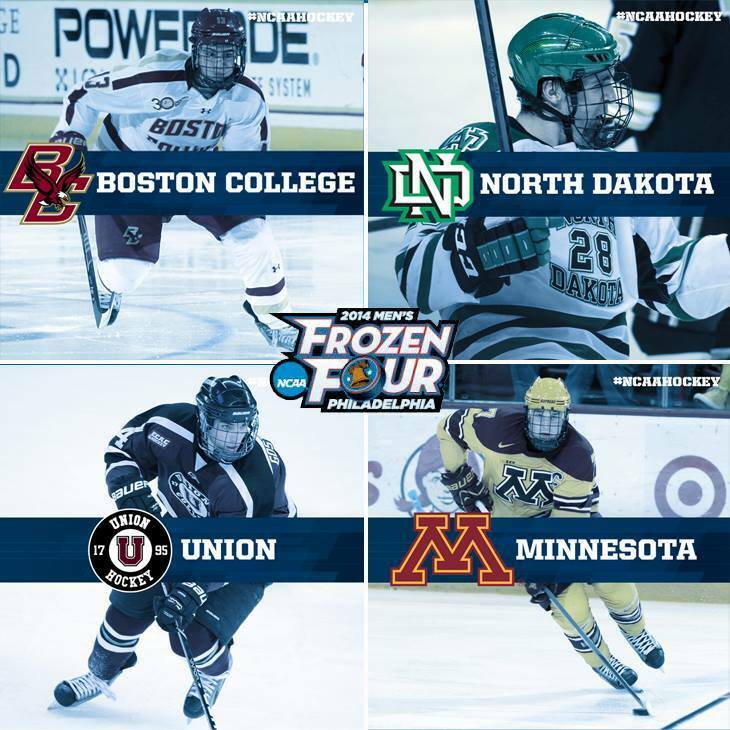 The Frozen Four moves to St Paul, MN for the 2018 championship. 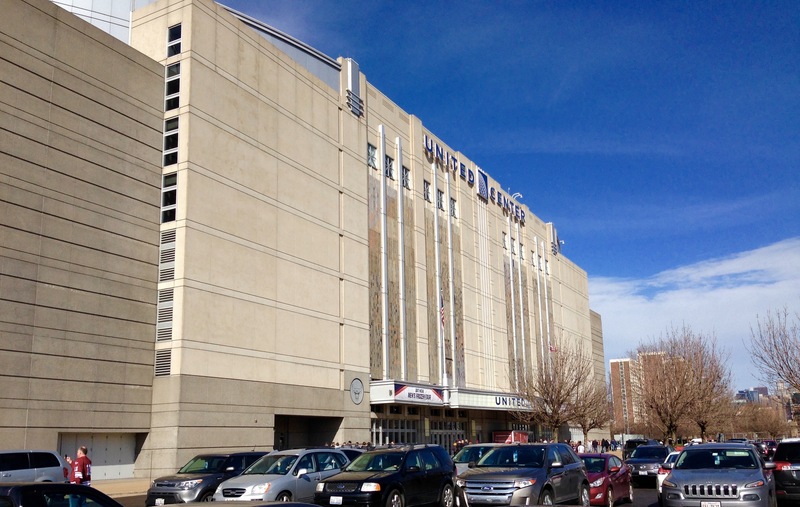 Walking up to the United Center in Chicago. We have never parked this close to the arena before. 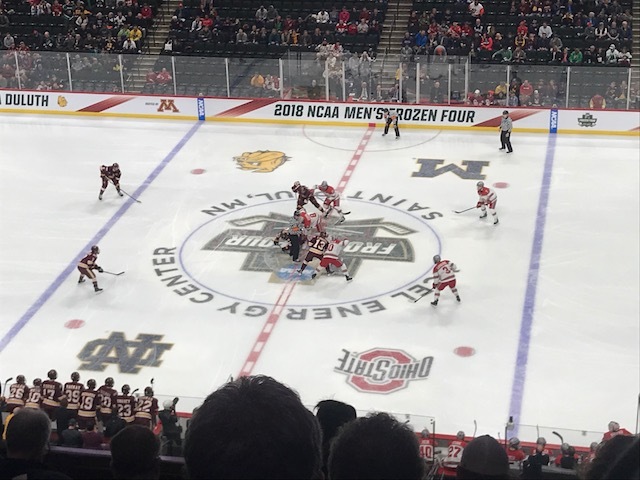 The Frozen Four moved to Chicago for 2017, and the Frozen Foursome was down to two of its regular members, and their ringleader unable to make the trip. All of this meant that we were getting by as the Frozen Trifecta. 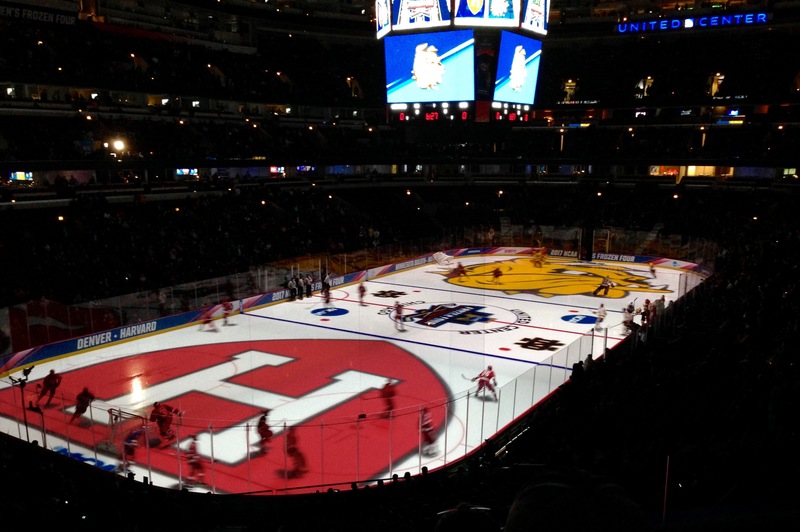 Harvard was to take on the University of Minnesota Duluth in the first game. Both teams had been number one seeds in their regional the week before. Harvard would score first on a power play goal by Tyler Moy in the first period. Duluth had looked very good up to that point with several scoring chances behind an excellent forecheck, but it was the Crimson that would draw first blood. The Bulldogs would tie things up 3-1/2 minutes later on a goal by Joey Anderson. The second period was scoreless, and the game remained tied until late in the third. Duluth’s Willie Raskob placed a beautiful pass onto Alex Iafallo’ stick, and Iafallo slipped the puck between Harvard goaltender Merrick Madsen’s legs with 26.6 seconds remaining in the game, for a 2-1 UND lead. UMD looked to be in great shape, but then they iced the puck. With the face-off deep in Duluth’s end, the Crimson furiously attacked the net, with a shot hitting the pipe, and another hitting the crossbar. Duluth would hang on to win, sending them into Saturday’s championship game. Madsen had 36 saves for Harvard, and Hunter Miska had 39 for Duluth. 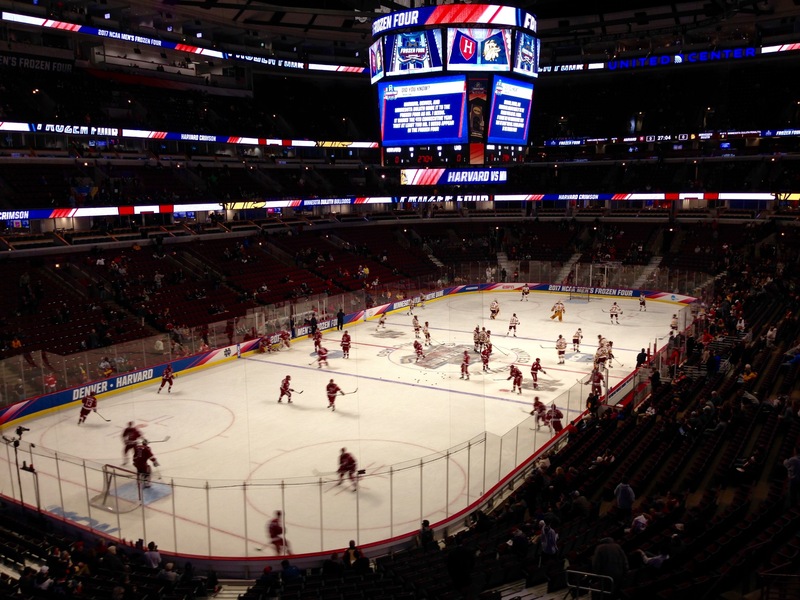 The University of Denver Pioneers would face the Fighting Irish of Notre Dame in game two. It was obvious early, that the Irish would have their hands full. Denver totally dominated play in all three periods and would go on to a 6-1 win. Cal Petersen of Notre Dame would have 36 saves on the night, and Tanner Jaillet of Denver would save 16 of the 17 shots he faced. 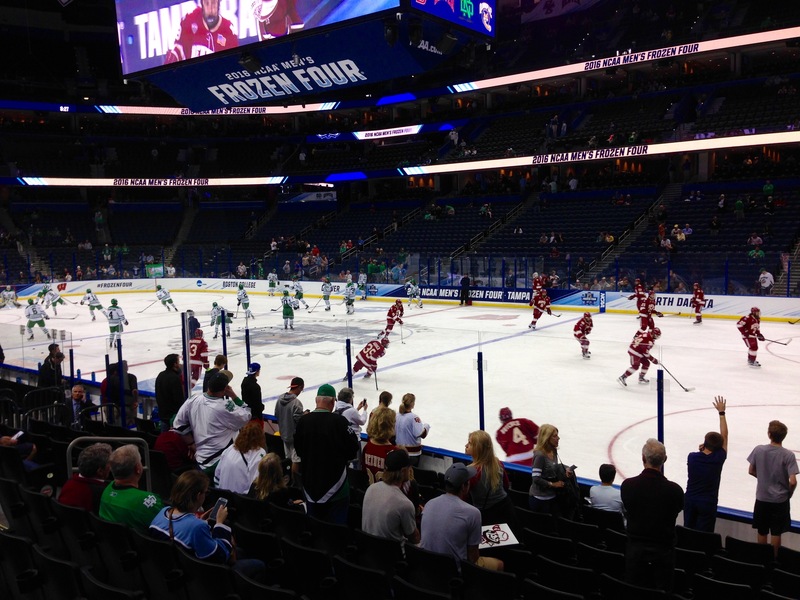 In Tampa for the Frozen Four. 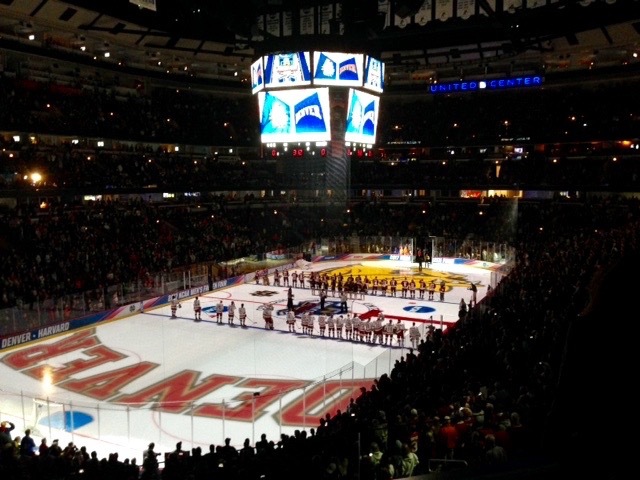 The second time this city has hosted the Division 1 Hockey Championship game in four years. 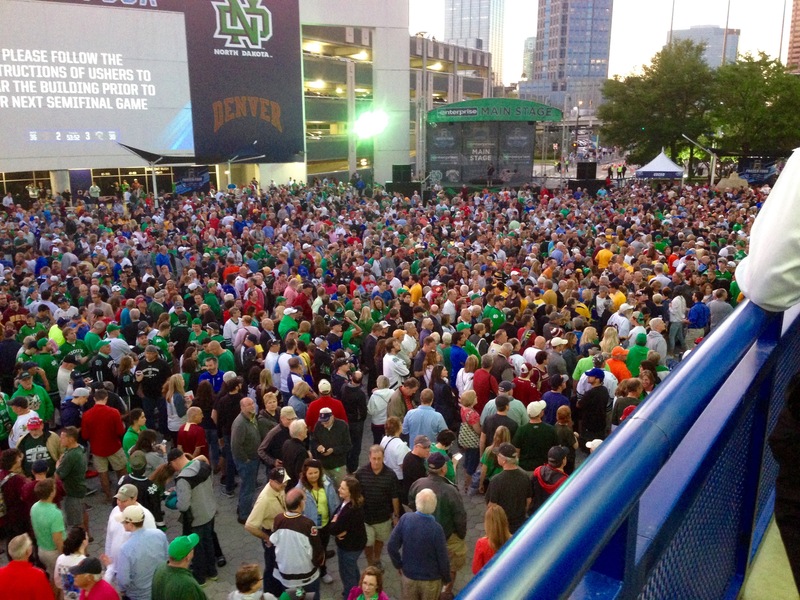 Tampa has quickly become a hockey town, and once again we have received an enthusiastic reception. Thursday held the two semi final games. The east faced off with the Quinnipiac Bobcats facing the Boston College Eagles. Quinnipiac started quickly, taking a 2-0 lead into the first intermission on goals by Kevin McKernan and Andrew Taverne. Alex Tuch put BC on the board, but the Bobcats responded right away on a goal by Landon Smith to keep a two goal lead. Ryan Fitzgerald of the Eagles scored in the third to make things very interesting. I was pulling for Quinnipiac, but admit I wanted BC to score on that power play. In a great game one, Quinnipiac held on to the 3-2 win. In the second semifinal, old foes Denver and North Dakota would go to battle. The first period was tight, and scoreless. In the second, Drake Caggiula would open things up for the Fighting Hawks, with two goals. Denver would rally to start the third and tie things up at two, but the Hawks would come back with two more goals, including an empty-netter. The Fighting Hawks would win 4-2, with Caggiula getting a goal and an assist. 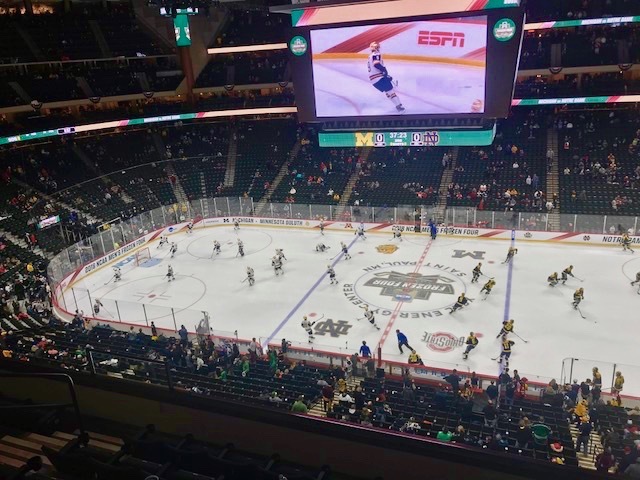 The Championship game was held on Saturday, with Quinnipiac facing the Fighting Hawks. The Hawks would score first, with a goal by Shane Gersich. Quinnipiac would go on a power play, but would have a costly error allowing Brock Boeser to come in on goal alone. Bobcat goaltender Michael Garteig came out of his crease to play the puck away from Boeser, but ended up hitting the forward from Minnesota in the thigh. With Garteig completely out of position, and the net empty, Boeser easily put the puck in the net for a two goal lead. QU would be chasing their tails out on the ice for much of what remained in the period; they were in complete disarray after falling behind 2-0. Luckily, the Hawks helped them out by taking two penalties. With the two man advantage, QU score to make it 2-1. The second period was scoreless, but Drake Caggiula would take over the third period with two goals in the first four minutes. The Hawks added one more in the 5-1 killing, and their 8th National Championship. Caggiula had the two goals and Boeser had a 4 point night. 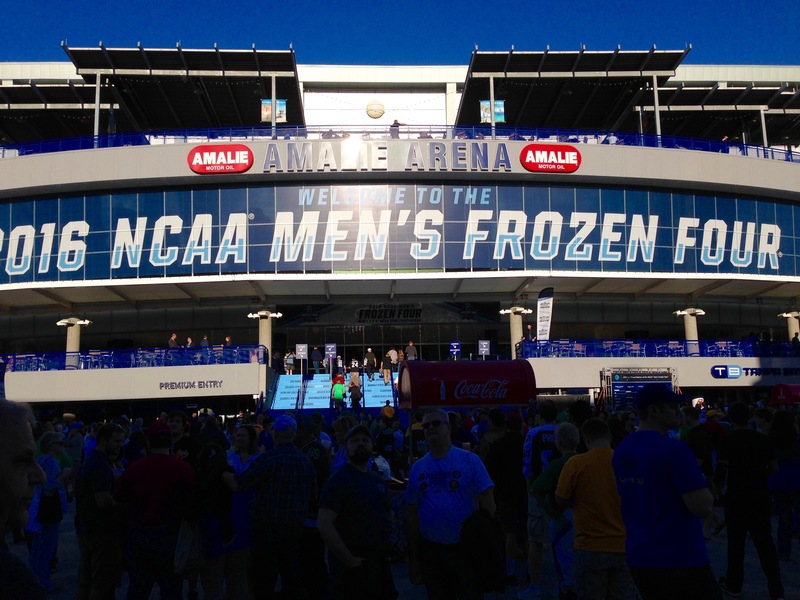 Attendance was 19,358, good for the third highest in Frozen Four history, although most of us fans do not count that year held in a football stadium. 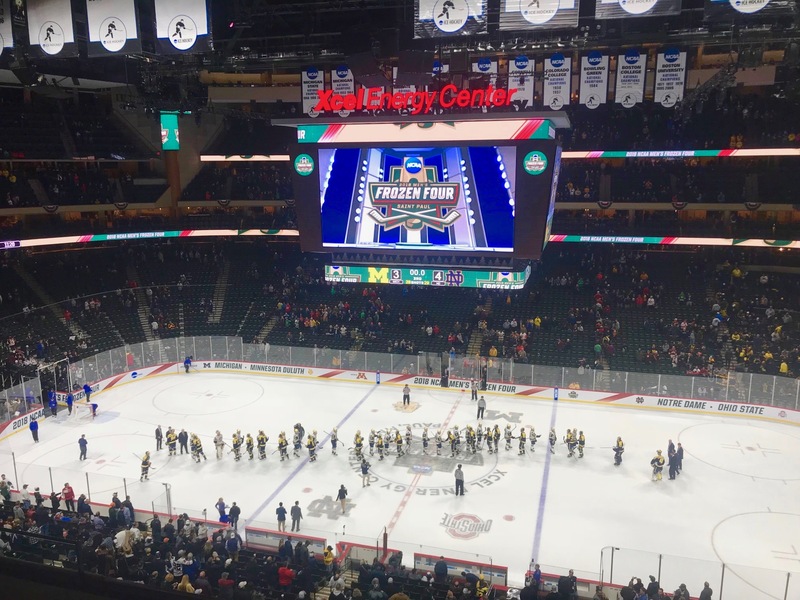 The teams that will play for the NCAA Division One National Championship in hockey are set. 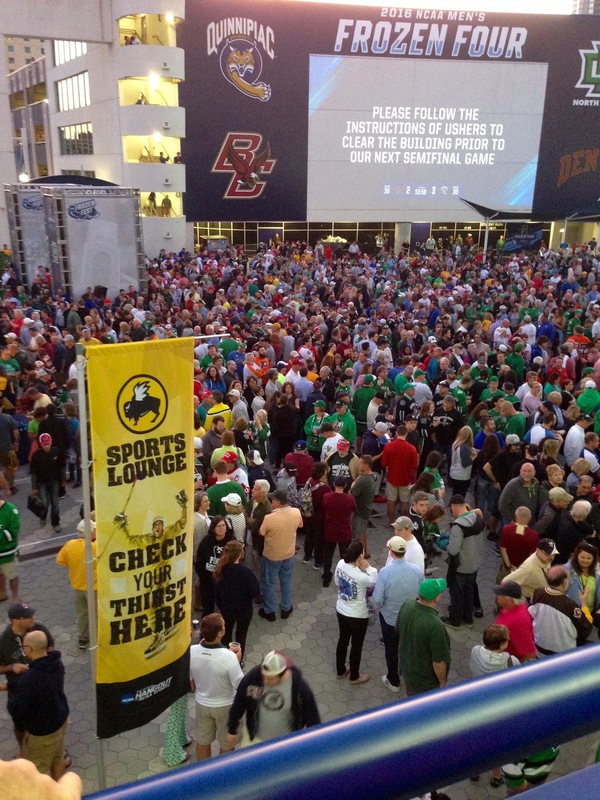 Boston College will play Union in the first semi-final game on Thursday April 10. 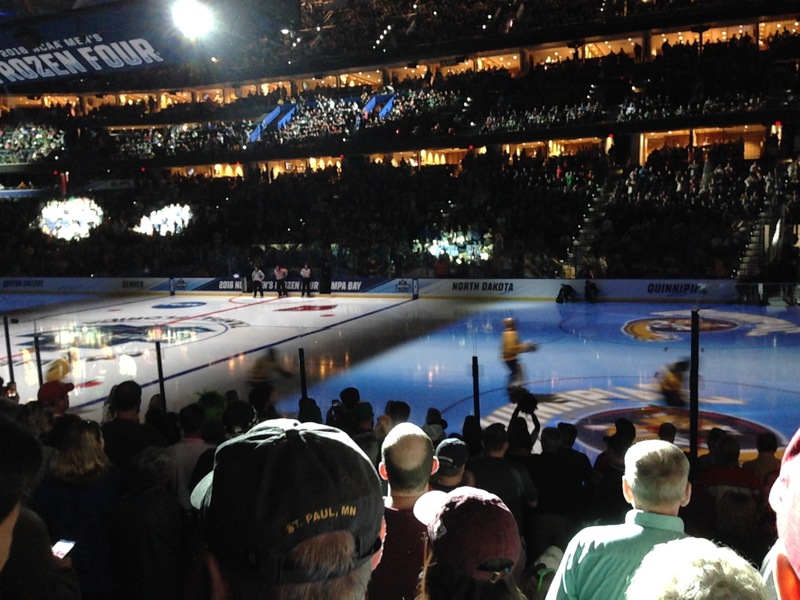 Arch-rivals Minnesota and North Dakota will face off in the late game. 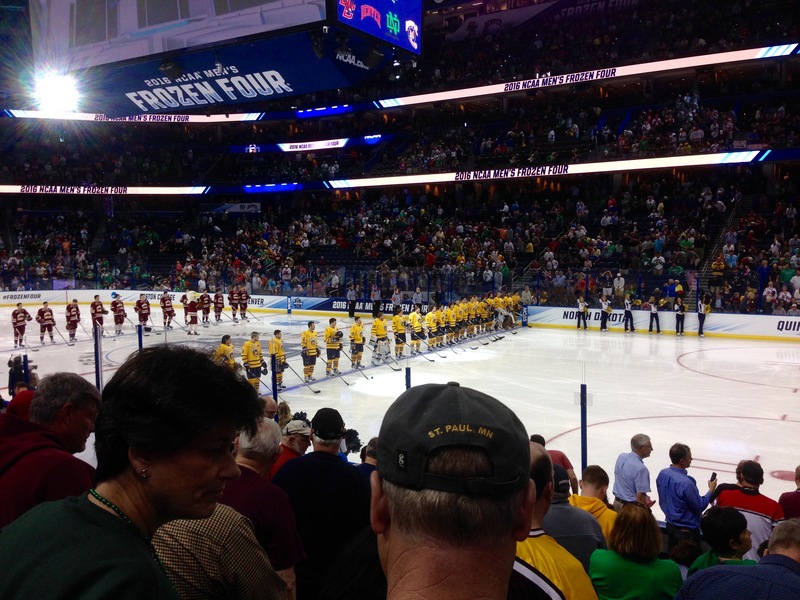 Last year saw four teams who had never been to the Frozen Four head to Pittsburgh. This year will have three teams that have been there 65 times. Boston College: 24, Minnesota: 21, NoDak: 20. 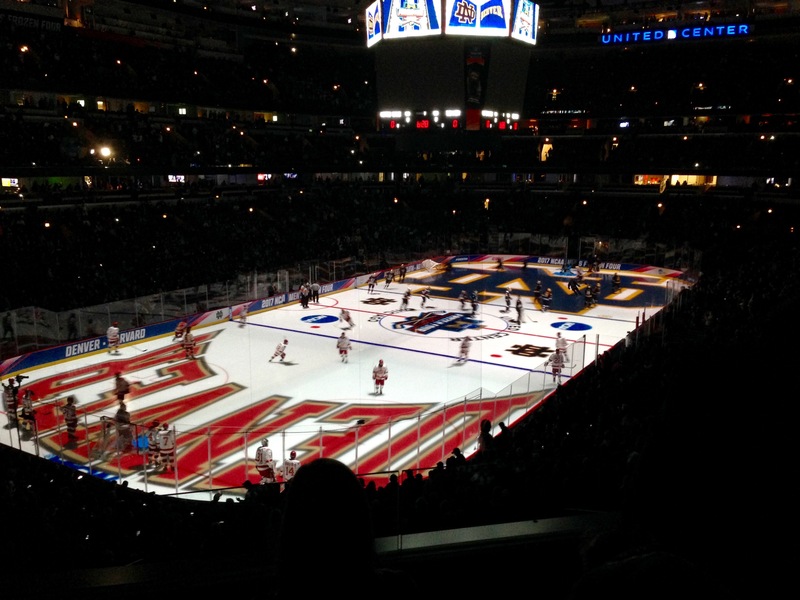 This will be Union’s second trip to the Frozen Four.